Valentines Day is going to be here before you know it. And, with Valentines Day comes the Valentines Cards. We all love sending out Valentines Cards to our friends and loved ones, but we hate sending the same old cards we get every year from the store. Well, how about doing something different this Valentines Day…. make the Valentines Cards yourself. Today I’m going to show you how to make Cupid Valentines Day cards. You can choose to print off a colored template or print off the black and white version and color it yourself. Either way the receiver of this Cupid Valentines Day Card is sure to love it. 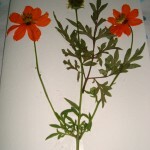 Today I’m going to show you how to make a Pressed Flower Card. This card can be used for any occasion that comes around. Imagine the excitement of anyone who receives this greeting card. They are sure to love it. 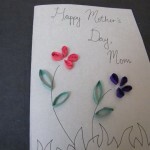 Made from flowers and construction paper your kids are sure to have a lot fun making this card. So grab the materials needed and let’s get started. I am going to show you how to make a greeting card that is so unique from any other you have seen or made before. It uses a new technique called thread painting and it is so much fun. This greeting card is perfect for anytime of year and for any family or friend. They are sure to love it. So, let’s get started on this thread painting craft. Not only will you enjoy doing it…. the result of this craft is always a surprise. Christmas is just a few weeks away….. now is the time to send out Christmas cards so that your friends and family receive them well before Christmas. 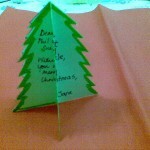 Well, today I’m going to show you how to make your very own 3-D Christmas cards. These are perfect for big families because there is plenty of room to write everyone’s names. Not to mention, everyone will love receiving these cards ….. especially since you made them yourself. 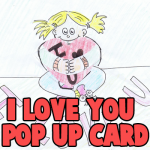 Today, we will show you how to make this really cool Valentine’s Day Pop Up Card craft for kids. 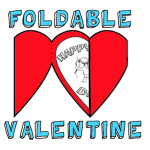 Learn how to fold and cut paper to make a pop-up card with a girl hugging a Valentine’s Day heart. People will love receiving this card…so learn how to make it. 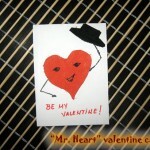 Today, we will show you how to make this really cool Valentine’s Day Card craft for kids. 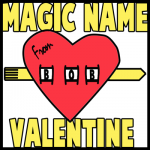 This is a really cool card that will show the name of your friend’s name or loved one’s name when moving the heart’s arrow. Learn how to make it on the following tutorial page. I made this heart with wings accidentally today so I thought that I would share with you how I made it. 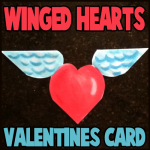 You start out doing a bit of paper folding and origami and then you start cutting a bit….what you turn up with is a valentines day card heart with wings. You can give this to somebody that you love on Valentines day. 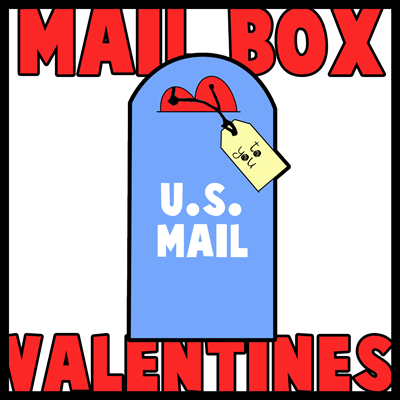 Learn how to make this adorable mailbox with inserted Valentine’s Day heart and tag. Your friends and family members will think you are so sweet and creative to give this to them. The printable paper template can be found below, a well as directions. Have fun and send the love. Make an African Styled Art Kwanzaa Greeting Card to celebrate Kwanzaa this year. This card is very simple to make and just requires some paper , scissors and glue. 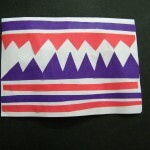 The simple instructions for making this colorful Kwanzaa greeting card are as follows. This is an adorable Easter Card Idea for kids. We have provided both a color and black and white coloring page printout version of this Easter Mother duck sitting on eggs in nest card. 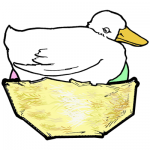 The duck can have an Easter card message and slip right into and out of the nest. It is a great idea for preschoolers, school aged children, and teens as well. 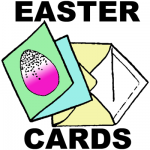 It is time to start thinking about making Easter cards for your friends and loved ones. 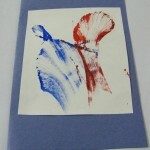 Here is an easy idea for all you kids out there who want to start making your Easter greeting cards. This is a really cool looking card with an Easter egg filled with glitter…and everyone will love the great results. This is a great activity for preschoolers, toddlers, and kids of all ages. Children love crafts projects that make real working moving parts. This is an adorable Easter card that has real working parts with little work at all. 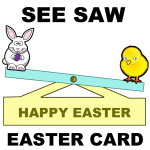 This is an adorable, working see-saw with the Easter bunny on one side and a baby Easter chick on the other. The see-saw goes up and down with the use of a simple fastening clip. All you have to do is print, cut out, and then fasten the 2 parts together. Easter is coming very soon so it is almost time to make your own homemade Easter greeting cards for friends and loved ones. 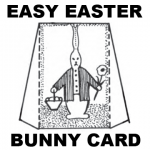 This crafts project is to make a standing Easter Bunny card which even young kids will be able to draw for themselves. This is a fun, and attractive Easter Bunny craft for preschoolers, Kindergarteners, 1st graders, and other young children. 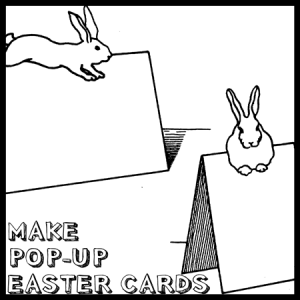 Easter is coming up and I have an Easter Bunny Pop Up Card craft for kids, teens, or adults to try. You have the choice of printing out the cards or you can follow the measurements and directions below without printing. Either way, this is a fun, and attractive Easter craft to work through. Good luck and Happy Easter.